Hi! It’s Sara, from Radiant Home Studio, here. Today, I’m sharing a fun holiday project from Present Perfect. 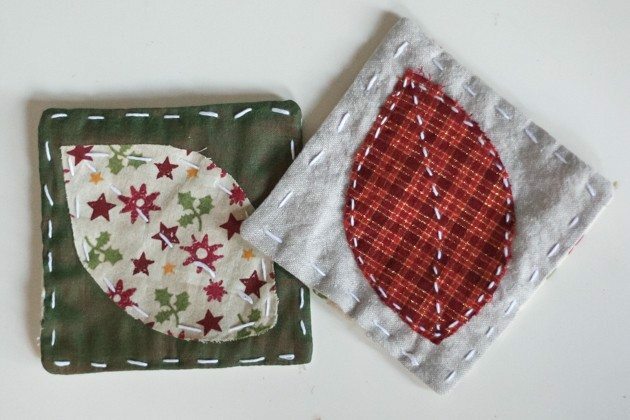 Using some Christmas fabrics and metallic embroidery floss, I’ve created some festive holiday coasters. 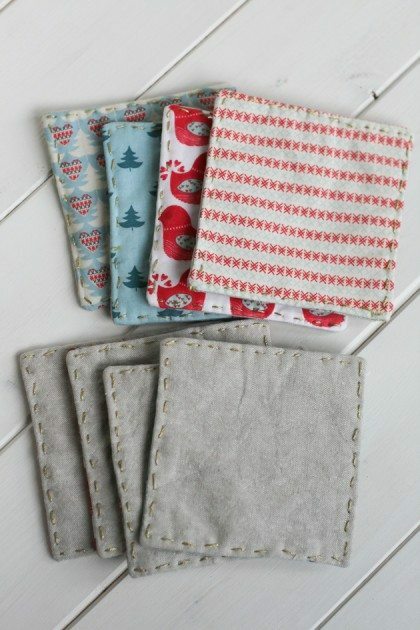 They are quick to sew and make beautiful gifts for your friends. 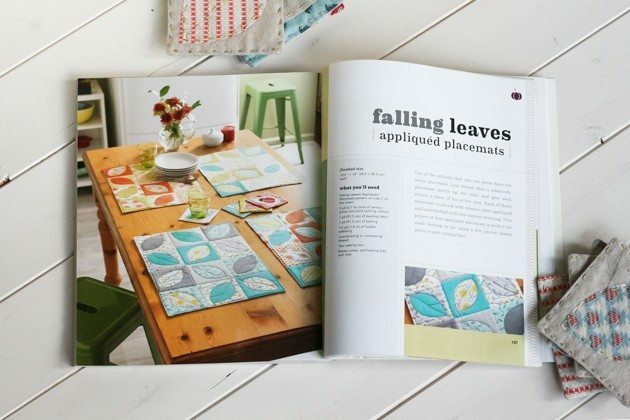 The Falling Leaves pattern from Present Perfect is for appliquéd placemats. I think placemats are beautiful, but with 6 kids I just can’t keep up with one more thing to wash! As a side note in the book, Betz mentions than you can make a matching set of coasters. I love this idea! The pattern recommends machine-stitching the leaf edges. I love the casual free-motion stitching, but I had some metallic embroidery floss that I wanted to use. I decided to use a running stitch around the edges of the leaf and the edges of the coaster in place of the machine stitching. Though it takes a bit more time, I think hand-stitched gifts are beautiful and worth the effort. 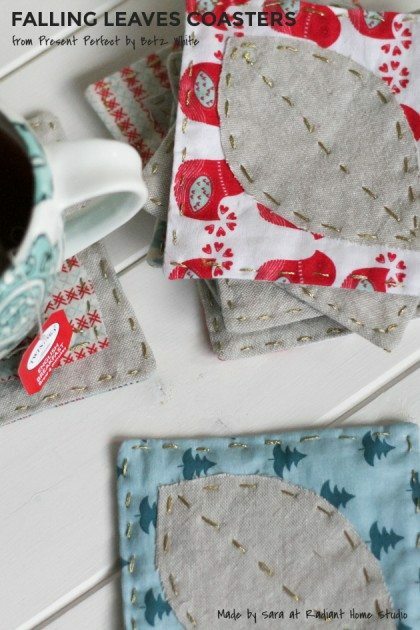 I used 4 coordinating Christmas fabric prints and some linen to make 8 matching coasters. I bought ¼ yd. of each fabric and had plenty left over. I made them in 2 sets. Four of the coasters have linen leaves, printed backgrounds, and linen backs. The other 4 have printed leaves, linen backgrounds, and printed backs (different prints than the front leaf for contrast). This made a really nice set of coordinating coasters with none that are exact matches. While I was working on my coasters, my daughter and her neighbor friend (ages 9 and 10) wandered in from playing outside and wanted to do a craft. The coasters were so quick and easy I cut out some for them and got them started making their own. I helped them to get the corners square and gave them some tips along the way, but they did a great job! Though I’m planning to keep my coasters for myself, I thought I would also share another gift idea. The Falling Laves coasters would be the perfect addition to a gift basket for a teacher or friend at the office. 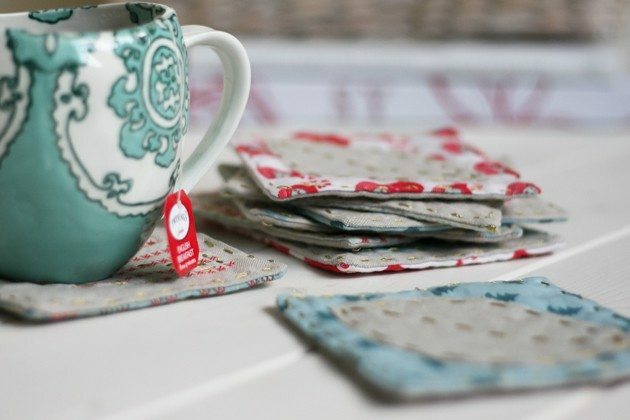 A pretty teacup, some comforting tea, and set of handmade coasters would make a thoughtful and beautiful gift basket. And since it is the season for giving gifts, I’ll leave with a quote from the introduction to Present Perfect. “Receiving a handmade gift feels incredibly special, knowing that it was made with love and care just for you.” I hope (as I’m sure Betz does!) 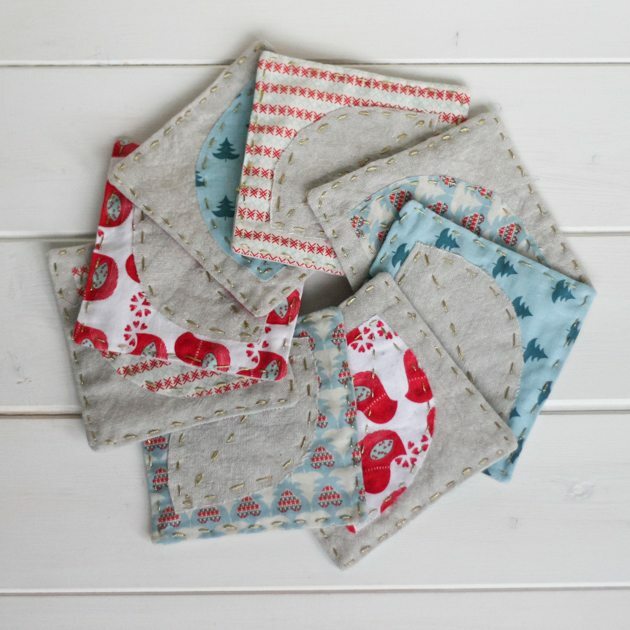 that you will enjoy planning, making, and giving some handmade gifts this year!